Nimble is proudly headquartered in Santa Monica, CA. We make it easier for you to be more productive and successful by providing you with a Social Sales & Marketing CRM that is intelligent and simple to use. We designed Nimble with a focus on making each and every one of your business relationships meaningful and mutually beneficial. Nimble helps you to identify the right people for your business to reach out to connect and to turn your conversations into measurable outcomes. Our vision is to make the job of all your customer-facing team members easier and more effective by working for them, everywhere they work. What makes Nimble unique is that it builds itself from the data around your business - from your Google or Office 365 Contacts, calendar activities and social and email conversations. Your contacts are instantly enriched with background details from social networks and third party databases and kept up-to-date. Nimble delivers sales intelligence by enriching company details including industry, company size, location, employee count, revenue and more to help target the right companies. Our segmentation feature allows you to drill down into subsets of your contacts to find specific people to take actions like sending Group Email Messages. Save time with email templates and custom merge tags to reach out to up to 300 people per day. Track message opens and clicks to know exactly when your contacts interact with your outreach, making it easier to identify your hottest prospects. See desktop notifications and detailed analytics on the number of times a contact has opened or clicked on your message without leaving your Gmail inbox. Nimble’s Mobile apps for iPhone and Android give you a smart calendar with insights, anywhere you work. Get reminders before and after meetings to make sure you never miss an important note and sync your phonebook directly to Nimble. Nimble is all new! Watch this video to learn about the latest features. Rieva Lesonsky offers expert tips on how small businesses can navigate the holiday season and score great deals on products like Nimble. Choose a nonprofit that aligns with your company’s brand and philosophy GuideStar can be helpful for this). It can be local or national, specific or broad; it depends on the reach of your company. Coordinate ahead of time with the nonprofit and make sure you have permission to talk about them and their cause in your messaging. Be sure to include relevant links for customers to go above and beyond in their individual giving. This will also help the nonprofit’s SEO. 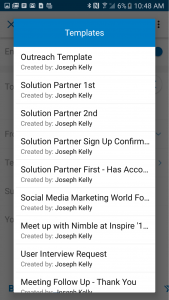 Today, Nimble launched their Android Mobile CRM 3.0: an all-in-one relationship manager that unifies business and sales team’s communications, social media interactions, contact records, and calendar events to give them the tools they need to build better relationships and stay on top of important follow-ups while managing their sales process cycle and pipelines. Just in! 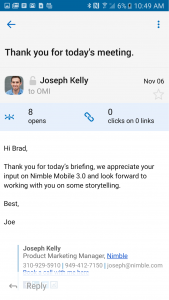 Today, Nimble launched their Android Mobile CRM 3.0, an all-in-one relationship manager that unifies business and sales team’s communications, social media interactions, contact records, and calendar events to give them the tools they need to build better relationships and stay on top of important follow-ups while managing their sales process cycle and pipelines. You can now prepare for meetings by taking a quick look at social insights, contact engagement history, and sales intelligence, all from your mobile device. In the digital marketing world, a key aspect of success lies in your ability to follow up and follow through. Growing businesses are becoming increasingly dependent on technology for a variety of things like organization, contact management, and sales intelligence; Nimble Mobile has arrived at the perfect time to fill that niche. With Nimble, you can prospect smarter, follow through quicker, and stay up to date on important projects while on the go. Check out your email conversations, calendar events, and social interactions for every team member and contact; all synced into one convenient location. Nimble automatically creates detailed digital dossiers for both customers and prospects that can tell you who they are, what their company does, and how to reach them. 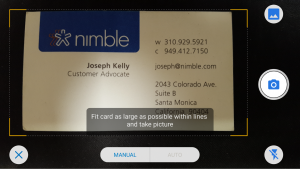 Use Nimble’s Business Card Scanner to instantly download important contact info from anyone’s business card. You’ll receive a complete social profile and company background, giving you the ability to make more connections on the go. Save yourself time by using personalized, templated emails with custom merge tags and pre-set attachments. You can track these emails from your mobile device and follow up quicker than ever, even while on the go. 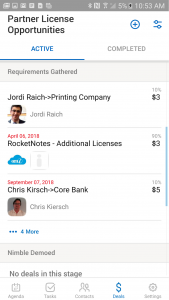 Manage your sales across multiple pipelines by using mobile voice commands to take notes assigning follow-up tasks to team members, and setting up important reminders to follow through. Even the busiest of entrepreneurs, business owners, and marketing professionals can prepare for meetings and find out everything they need to know about important contacts in just a few clicks. Let’s take a closer look at the many features of this valuable CRM application. -Prepare for important meetings, interviews, and pitches. In order to build authentic connections in the professional world, you need to know important information about them, such as their personal interests and company background. Android Mobile 3.0 provides these insights in a matter of seconds. -Scans business cards. Nimble’s business card scanning feature gives you the opportunity to network more efficiently on the go by taking a picture of any business card and storing the information in your mobile database for whenever you may need it next. -Sends tracked and templated emails. Rather than wait to send an email from your desktop, you can use Android Mobile’s customized email templates to send out personalized emails at scale, and follow up more quickly while on the move. -Manage important tasks and stay up to date with team members. Nimble strengthens group communication by making it easier to delegate tasks to team members, take notes via voice command, and set important reminders to follow through. -Share your meeting and communication history with anyone you choose. Nimble provides you with instant context to any interaction you have so you don’t have to worry about a busy inbox standing in the way of an important conversation. -Synchronize contacts from a variety of databases. Nimble automatically syncs up every email conversation, social interaction, and calendar event for team members and contacts alike, providing you with a single, convenient location to view them. In the age of social media, it’s more important than ever to have the right tools to communicate and connect with people in your professional network. With an increasingly mobile lifestyle comes the need for a technology that will connect people with their team members and prospects on the go. 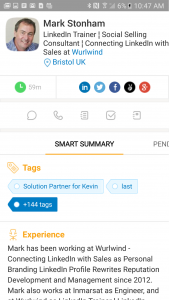 Now, with Nimble Mobile 3.0, you’ll never have to worry about missing out on an important connection again; prospect smarter, network better, and stay in sync with your team, all while on the go. Nimble’s pioneering social sales and marketing CRM helps teams and professionals turn relationships into revenue — without the busy work. Everyday, people use Nimble to successfully nurture their personal and business relationships across email, social networks, and more than 130 cloud-based SaaS applications. The smart, simple CRM has been named best CRM in Market Leadership, Ease of Use, and Satisfaction by many experts including: CRM Watchlist Winner for three consecutive years, #1 CRM for Small Businesses by G2 Crowd for the fifth consecutive time, #1 Sales Intelligence Tool for Customer Satisfaction by G2 Crowd for the fifth consecutive time, and #1 Small Business Sales and Marketing CRM by Fit Small Business. Nimble combines the strengths of traditional CRM, classic contact management, social media, sales intelligence, and marketing automation into one powerful relationship management platform that delivers valuable relationship insights - everywhere you work. For more inbound and digital marketing tips for your medical practice, contact us to schedule a free digital marketing assessment and consultation. Please note: The Friedman Group a digital marketing agency based in Denver, Colorado, and we work with doctors and other professionals across the U.S. Our digital marketing services include: inbound marketing, social media marketing, and marketing strategy and development. @Nimble @G2Crowd Check out the top engaged members in my community this week! Looking forward to getting in touch with you in case you need more information about covering Nimble.